Crazy in Suburbia: Mitt Romney's Ties to a Drug Kingpin? Mitt Romney's Ties to a Drug Kingpin? So, I'm a big fan of Breaking Bad, and am glad it's back for its fifth season. And the web that chemistry-teacher-turned-meth-super-manufacturer Walter Walt keeps spinning just keeps roping him into ever more complex, dangerous situations with ever more sinister personalities. One just wonders how far Walt's schemes will take him. The season opener offered some clue, and it might plunge Walt into a tangle that might not be unfamiliar to POTUS wannabe Mitt Romney. I'm talking about the tangle of off-shore financing, of which Mr. Romney is all too familiar, according to various news reports. Apparently Romney has dug himself his own financial black hole What information Romney has publicly disclosed "provides a fuzzy glimpse at a concerted effort to park much of his wealth in overseas tax shelters, suggesting a widespread pattern of tax avoidance unlike that of any previous candidate," the New York Times says. Romney's 2010 tax return "showed at least 20 investments not previously listed on disclosure reports, but it did not provide enough information to evaluate their size or holdings. Neither the tax return nor other disclosures have revealed the full amounts of Mitt and Ann Romneys’ other offshore holdings over the years, including investments in Germany, Luxembourg, the Cayman Islands, Australia and Ireland." Breaking Bad fans, who else do we now how had an off shore account in the Cayman Islands? Gus Fring, the late great coolly malevolent drug kingpin whom Walter White dispatched at the end of Season 4 in a cleverly rigged wheelchair bomb. The DEA and cops seized various bits of evidence from Gus' office at his fast-food chicken restaurant. 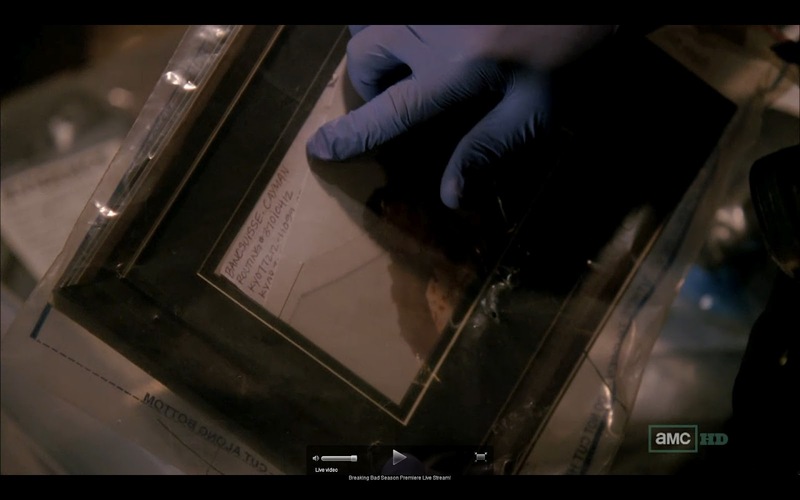 At the end of the, err, magnetic episode, the cops found a notation, hidden behind a photo that had been on Gus' desk. The notation showed the routing number for an account at the BancSuiss in the Cayman Islands. Hmm. Does the cool, maybe malevolent Romney have those kinds of secret notes hidden behind photos in his various houses? As I posted on my Facebook, it seems that Romney shares a penchant for off-shore accounts with Gus. (Some would also say that Romney somewhat shares Gus' final fate of two-facedness). I also wonder if Gus and Mitt shared the same friendly Cayman Islands banker. Or maybe the two hung out in the Cayman Islands, say at the Ritz Carlton. Maybe Mitt and Gus went jet skiing together, along with Mitt's wife Ann and Gus' henchman Tyrus. Shhhh.... some of us are still doing Season 4 on Netflix! Allude, but don't tell. Please. Or start with "spoiler alert." I'm afraid many super wealthy Americans have offshore accounts, be they drug lords, Presidential candidates, Hollywood moguls, etc. Your blog so your rules but this post is below you. Suspecting this post is but light-hearted fun, I will be civil especially because I too am a fan of Breaking Bad. However, the innuedo here is that Romney is doing something wrong akin to drug trafficking by protecting his wealth from big govt money grab through taxes. This conduct though is not only to be commended but it is keenly American. We fought the Revolutionary War in large part because of oppressive taxes. We should celebrate that people who make the right choices in life such as Romney can excel without ceilings and he has done so in spades. I wish I had made similar choices and life decisions and/or had the smarts AND ability to execute to be as successful. Even more impressive is that most of his wealth generation was done in the private sector off of which the govt feeds. Remember the govt doesn't "sell" a product or service on the free market. Rather, it takes by taxes from those who do to make and administer the rules we all are to live by. Shouldn't we be more suspecting of people such as President Obama who spend most of their entire lives not only outside of the contributing private sector but in active agitation against it as a community organizer only then to become a professional politician again living off those who generate the money by which he is paid? Shouldn't we be more suspecting of people who aspire to lead in the executive branch that are unable to manage their finances in a way such that they were underwater all their life until becoming proffesional politicians? Paying the bare minimum in legally required taxes or trying to legally minimize the amount taxable seems to be less concerning than a purported brilliant academic sealing and keeping private his scholastic records (and, although I'm not a "birther", the long drawn out process re his birth certificate). The comments re professional politicians are not necessarily partisan because there also are professional Republican politicians, though less, who have not worked in the private sector. I am not aware of any of our founders that envisioned such "professional" politicians in any positive light but I am aware of many such as Washington and Jefferson that envisioned public service as a valuable but temporary occupation from the private sector. Governing to them was more a pesky necessity than a goal in and of itself as a tool for social change. Getting back to Breaking Bad, I would think that the connection of the drug king pin Gus is more to President Obama than to Romeny. Gus is a thin tall African American with short trimmed hair as is President Obama whereas Romney is tall medium build and white with perfectly coiffed hair. Gus makes his money by making people dependent or hooked on his product as does President Obama when seeking to expand dependency on government or even community rather than oneself whereas Romney made his money by investing in other companies in the private sector sometimes successfully and sometimes not but with the idea that the relationship was temporary rather than long term dependence. Gus is a smooth and calculated talker as is President Obama whereas Romney, while competent, is not as measured in words or skilled in delivery. Yes, me thinks Gus is more akin to President Obama than Romney. In the end, this is just good natured fun so maybe we should continue. Which has more Drapper style cool? Which prefers Captain Kirk to Piccard? Which is more Dirty Harry and less Cagney & Lacey? Which do you think prefers MaryAnn or Ginger? Which prefers Run DMC's version of Walk this Way to Aerosmith's original? Which gave in to more youthful indescretions? Which is more Paul Newman and which is more Robert Redford? And, most importantly, which is more Brady Bunch and which is more Patridge Family? Why do you not focus on Obama's millions spent sealing everything in his past? Romney has been a good citizen who paid millions a year in taxes. He was a successful governor and leader of the SLC Olympics.